Tufted Titmice are common in eastern deciduous forests and delight bird watchers with an entertaining behavior of flitting through tree branches, hanging upside down from twig-ends, and cracking seeds with sharp pecks of its stout bill. It is an assertive bird at the bird feeder and bird bath, seemingly unintimidated by larger species. Both sexes: A small, grayish blue bird with a crested crown, a large, black eye and a black bill on a pale, gray face. Underparts are whitish with rusty flanks. Adults have a black patch on the forehead. Deciduous and evergreen forests, suburban yards, parks and orchards. Tufted Titmice eat insects and spiders, when available, and also seeds, nuts and berries. In Tennessee, breeding may begin as early as mid-January. Pairs are monogamous and may use the same nest cavity multiple years. Nest: Within a cavity about 12 feet from the ground, the cup-shaped nest is constructed of leaves, moss, grasses or fragments of snake skin, lined with fur, hair, wool and cotton. Tufted Titmice often pluck hair off of live animals. Clutch size: 3 to 8 creamy white eggs spotted with rust, brown or lavender. Incubation: Eggs hatch in 13-14 days. Nestlings fledge in 17 -18 days and remain with their parents for several weeks, and sometimes through the winter. A high pitched phrase, “peter, peter, peter”, repeated many times in succession. Calls include a variety of nasal or high pitched notes. Readily joins in with other species in agitation or alert calls. 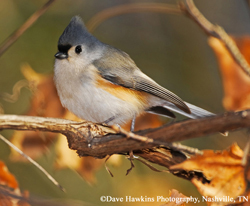 During the past 50 years the range of the Tufted Titmouse has expanded northward, probably because of climatic warming and increased bird feeding. During the non-breeding season groups of 2 to 4 titmice commonly move about with flocks of Carolina Chickadees and Downy Woodpeckers. In late summer multiple family groups of titmice may gather into flocks of over 20 individuals. Preferred box design for Tufted Titmice is slightly smaller than the NABS Eastern Bluebird box with a 1 ¼ inch entrance hole. This box design may also be used by Carolina Chickadees, White-breasted Nuthatches, House Wrens, and Prothonotary Warblers. • Use natural, uncoated wood such as cedar or redwood which are more durable than pine or exterior plywood. Use at least ¾ inch boards. • Never include an under-the-hole perch. • The roof should provide sufficient overhang beyond the box entrance or vent holes to protect the birds from the elements. • The roof should have a minimum of ½ inch overhang at the back. • The nest box must have watertight construction at all seams. • Cross ventilation is strongly recommended. • Include one hinged, side panel that opens for easy monitoring and cleaning. To attract Tufted Titmice, place your box in a more wooded area than recommended for Eastern Bluebirds. Place the box near woods, shrubs, and thickets, which are used for foraging and hiding from predators. Farms or barnyards where animals are fed are not recommended sites for boxes because these are attractive to House Sparrows. Avoid placing your box where pesticides or herbicides are used. The nest box should be mounted on a ½" to ¾" electrical conduit post placed over a 3 to 4 ft. piece of rebar. Both materials are available at hardware stores. Pound the rebar into the ground and slide the post over it, making sure that it is solid and steady. Mounting the box on a tree or fence post is not recommended. Mount the box so that the entrance hole is about 5 ft. from the ground and facing, if possible, to the east, away from direct summer afternoon sun and from north winds that may drive rain into the box. A tree or shrub that is within 100 feet of the box will provide a perch for the adults and a safe spot to land for the fledglings' first flight. 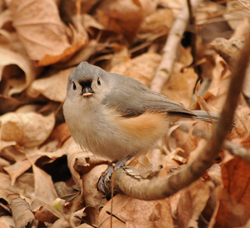 If you plan to put up multiple boxes in an area, we recommend placing boxes at least 100 yards apart to reduce competition between titmice and other species. Install a baffle to keep snakes, raccoons and other predators out of the nest. Squirrels or woodpeckers sometimes damage the entrance hole, making it larger and allowing undesirable species to enter the box. This can be resolved by placing a copper or other metal hole-guard (available at hardware or wild bird retailers) over the damaged hole. A block of 1.5" hardwood with an entrance hole made and placed over the original hole will also work. To prevent doing more harm than good, do not install a box if you do not plan to monitor it. Check the box once a week during the nesting season to monitor status of titmice or other native nesting species, check for leaks and damage on the box, and provide you with a wonderful education. Keep in mind that even the perfectly built and placed box may not attract a breeding pair the first year. If after two years of not having native birds nesting in your box, you may want to move it to another site. -Check the box only on a warm, dry day. -On your day to check the box, try to observe activity of the adults and approach the box while they are away. If they are present, don't worry that they will desert the nest. They may fly to a perch to watch you, and you may receive a few scoldings from them, but they will return when you leave the area. -Check for ants or other parasites. -Remove and destroy House Sparrow eggs and nests. -To prevent premature fledging, do not open the box after 12 days from the time the nestlings hatch. -Remove and dispose of the nest in the trash soon after the nestlings have fledged. They will not return to the nest and the adults will build another, cleaner nest for the next brood. -Keep records of the activity in your box.